Trials are continuing tonight, as are registrations for U5-U9. 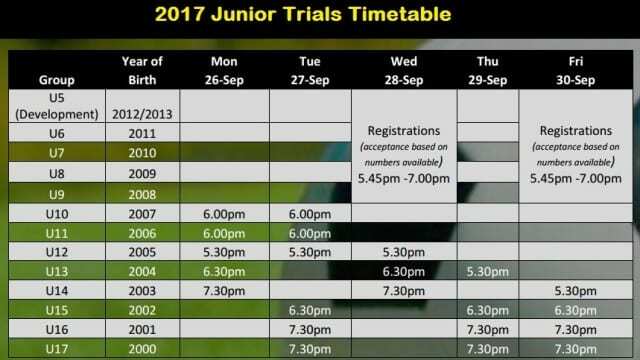 Season 2017 Club Information and Conditions for Trials For existing and new players. Dear Parents and Players Welcome to West Torrens Birkalla Soccer Club. It is an exciting time for Birks as we continue to grow and achieve success and we look forward to hopefully sharing 2017 season with you. Please read the following information carefully as it forms the framework for trials and registration process for the 2017 season. It will hopefully give you an idea of our coaching philosophy at the club. We wish you all the very best at these trials. Should you have any questions, please do not hesitate to contact one of the club representatives during the trial week, contact us at wtbirkallasoccerclub@gmail.com or via our website. Please download the below links for all the information you will require. If you will be coming out to trials please download the player registration form and have the form out filled prior to attaneding trials. On behalf of the Coaching Directors and Board of WT Birkalla, we are pleased to confirm the 2017 Coaches for U12-U17 teams. Along with the development of our players, WT Birkalla are also committed to the development and continual improvement of coaches. We ensure that all coaches are qualified at the appropriate level to coach their appointed teams. All JPL coaches have either attained their ‘C’ License qualification or are actively working towards it. We thank all parents and players for their continual support of these hard working club volunteers.